A Year Without Rain's jacket. Only the lines marked with an asterisk (*) are present on the short version of A Year Without Rain. 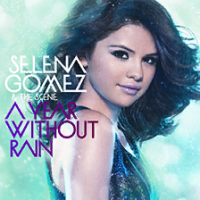 A Year Without Rain features its promotional video, eliminating any on-screen dancers. This page was last edited on 8 April 2019, at 15:58.